Kirk Douglas, Tony Curtis and Ernest Borgnine star in the classic Hollywood Viking Film that still remains exciting today. MGM R1 USA. The 1950s was the era of the big screen epic, although popular since the dawn of cinema, the epic films were boosted during the decade by the introduction of widescreen technology that made the spectacle even more impressive. The screenplay, adapted from a novel, is inspired by the semi-legendary history of the Norse King Ragnar Lodbrok who lived in the 9th Century, had sons named Eric and Agnar [Einar] and was eventually captured and killed by the Northumbrian King Aelle II - although aside from the names, there are few connections between the screenplay and the legends (Ragnar was captured in battle, and his first two sons were killed before he was, in battle with their father's own appointed ruler in Sweden). 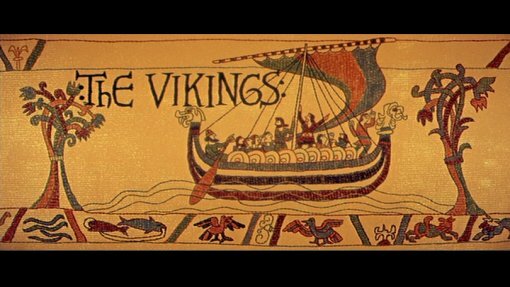 Fortunately, while many epic films in the 1950s and 1960s seemed to use plot as filler inbetween epic battle scenes, The Vikings boasts an enjoyable storyline, full of murder, revenge and betrayal, that although hardly thought-provoking or unpredictable, does a good job of capturing the spirit of a classic Viking Saga. Unfortunately the film does fall short in a few aspects: despite the two hour run-time, a lot of characters are poorly developed (the treacherous English Lord, and the mute servant especially) and the screenplay does seem to have been cut down from a much larger project with various plot aspects hurried over. However, thanks to this relatively short run-time, pacing is strong throughout, and the climactic battle is very thrilling. Endowed with a big budget, The Vikings looks superb - with full size ships (exact copies of real Viking ships), and location photography in Norway giving the film a real sense of authenticity. The mythology and atmosphere of the film was heavily researched and quite accurate, with only a few stylised Hollyood touches (namely Einar's winged helmet). Relatively small scale for the era, the film does boast a rather epic castle attack at its climax. The soundtrack from Italian composer Mario Nascimbene is instantly recognisable, with its famous three note theme and solid incidental music throughout. Top billed was the new big name in Hollywood at the time, Kirk Douglas - the manly action hero who came to fame with the classic Disney adaptation of 20000 Leagues Under the Sea (1954), also from director Richard Fleischer - suitably rugged, he fits the role like a glove, with a fantastic performance that would be hard to match. Ernest Borgnine as Ragnar, seems to be really enjoying the role and certainly looks the part. Tony Curtis is better known for his comedy films (most notably, the classic Some Like it Hot (1959)) and to fans of those films, he does seem rather out of place here and never quite seems to fit in. His wife at the time, Janet Leigh, plays suitably well as the love interest, in a rather undeveloped role. Despite some great performances from Kirk Douglas and Ernest Borgnine, authentic location shooting and a well paced script, The Vikings never quite gels - with a rather detached performance from Tony Curtis and a script that seems to be missing big chunks of characterisation. Fortunately it remains enjoyable throughout and comes recommended to all fans of classic adventure films. Ernest Borgnine - star of The Wild Bunch (1969), The Dirty Dozen (1967) and Emperor of the North (1973). Tony Curtis - best known for his comic performance in Some Like it Hot (1959). Janet Leigh - victim of the most famous shower stabbing in Psycho (1960) and also starred in The Fog (1980). Directed by anyone interesting? Richard Fleischer - the American born director who helmed the classic war film Tora! Tora! Tora! (1970) and sci-fi picture The Fantastic Journey (1966) as well as sword and sorcery sequel, Conan the Destroyer (1984). Any violence/gore? Plenty of violence and some surprisingly graphic deaths (for a PG rated film). Fans of classic action movies, and Kirk Douglas films should certainly enjoy this. The print is good with strong colours, some mild grain, minimal print damage. Audio Original English mono track, sounds fine. French and Spanish tracks sound slightly muffled but otherwise fine. Subtitles English, French and Spainsh. Other regions? Available on a similar release in Europe although without the documentary. Many television prints remove some of the more violent deaths - these are shown in full here. One of the true classic Hollywood adventure films - surprisingly accurate and enjoyable, but not without problems. Recommended. A very good looking and sounding DVD, with a very interesting documentary piece. All text in this review written by Timothy Young - 30th July 2007.